Software update point based client installation publishes the Configuration Manager 2007 client to WSUS, in fact, the software update point in SCCM, as an additional mandatory software update. 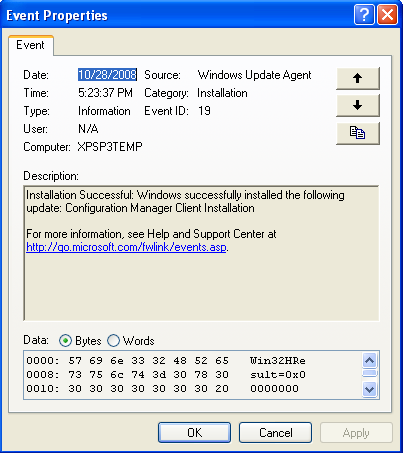 This method of client installation can be used to install the ConfigMgr 2007 client on computers that do not already have the client installed, or to upgrade existing ConfigMgr 2007 clients. In addition, if a client is uninstalled for any reason, the client will be reinstalled at the next Windows Update Agent scan. This ensures that your servers and workstations are always able to be managed by Configuration Manager. To use software update point based installation, you must use the same WSUS server for both client installation and software updates. This server must be the active software update point in a primary site. For more info, check out How to Create and Configure an Active Software Update Point. This information is not covered in this post, however, here are some helpful links to assist you in getting your SCCM installation configured for Software Update Point client installation. These templates allow you to provision site assignment and client installation properties that will be located in the registry prior to the client being installed. Here is a high level overview of what you must complete to deploy clients via Software Update Point Based Installation. It’s actually quite simple. Yes, that’s it! We’ll add one more step to this, but that is only to verify our configuration and test a deployment on a pilot machine. This step will configure the WSUS URL that clients will use to contact the Software Update Point and install the ConfigMgr 2007 client. It is important that the WSUS server is the same WSUS server used as the Configuration Manager Software Update Point, and that the SUP is configured as the Active Software Update Point. View the links in the Requirements section above for more information on how to do this. Ensure there are no other GPO’s that configure WSUS settings that are applied to the clients. If clients receive policies from multiple GPO’s that configure WSUS settings, the client will generate GPO Policy Conflicts and will not be able to install the client via Software Updates. This could adversely affect the application of Software Updates via Configuration Manager. Create a new GPO and link it to the OU that contains the computer objects you wish to deploy the ConfigMgr client to. Set the intranet statistics server to the same value unless the statistics server is located elsewhere. Use same format as above. Remember this is a computer configuration GPO and will only apply to computer objects in the OU and child OU’s that the GPO is linked to. 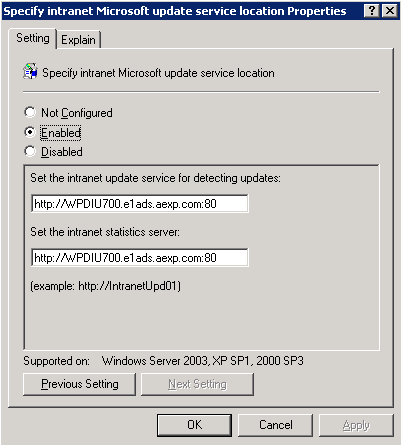 If you have not extended the Active Directory schema, or you wish to assign client installation properties via Group Policy to ensure that clients not able to query Active Directory for site assignment information, you can use Windows Group Policy to provision client installation settings to computers in your site. These settings will automatically be applied to any software update point based client installations. Additionally, it is useful to use the Client Assignment Group Policy template as a method to ensure that your clients are always assigned to the appropriate site. If a client unexpectedly is assigned to another site, Group Policy will override this setting and assign the client to it’s correct site. Import the Templates in Group Policy by opening the Group Policy Object Editor, expanding Computer Configuration, right-clicking Administrative Templates and choosing Add/Remove Templates. 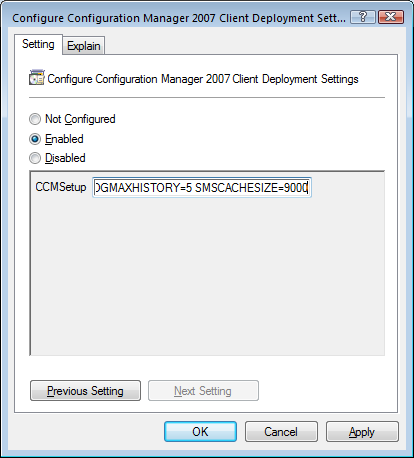 Click Add and browse for the ConfigMgr 2007 ADM templates. If you cannot see the properties of the imported administrative template, this might be because the filtering options for your Group Policy editor are preventing these from being displayed. Specify less restrictive filter options to display these properties. For instance, in the Filtering options dialog box of the Windows Group Policy Object Editor, clear the checkbox Only show policy settings that can be fully managed. Open the Configure Configuration Manager 2007 Site Assignment Properties dialog. Site Assignment Retry Duration: How long a client will attempt to reassign until successful or until it is reassigned to the site code specified in the GPO. You can check the following settings in the registry on the client to verify the GPO applied successfully: HKEY_LOCAL_MACHINE\SOFTWARE\Microsoft\SMS\Mobile Client. You may need to run the command gpupdate /force on the local client to see this policy take effect immediately. Enabling this policy supercedes the client deployment properties configured in the Configuration Manager console under Client Push Installation and uses Group Policy to configure client deployment properties. For more information on assigning client properties using Group Policy, see How to Provision Configuration Manager Client Installation Properties using Group Policy. For more information on client installation properties, please see About Configuration Manager Client Installation Properties. 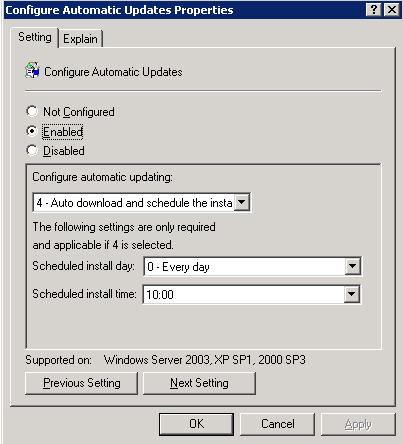 Open the Configure Configuration Manager 2007 Client Deployment Settings dialog. Type the Client Installation Properties that you want CCMSetup to use when installing the client. When CCMSetup is run from the command line without any installation properties, it will query the registry for these settings first, then will attempt to query Active Directory. You can check the following settings in the registry on the client to verify the GPO applied successfully: HKEY_LOCAL_MACHINE\SOFTWARE\Policies\Microsoft\ccmsetup. You may need to run the command gpupdate /force on the local client to see this policy take effect immediately. 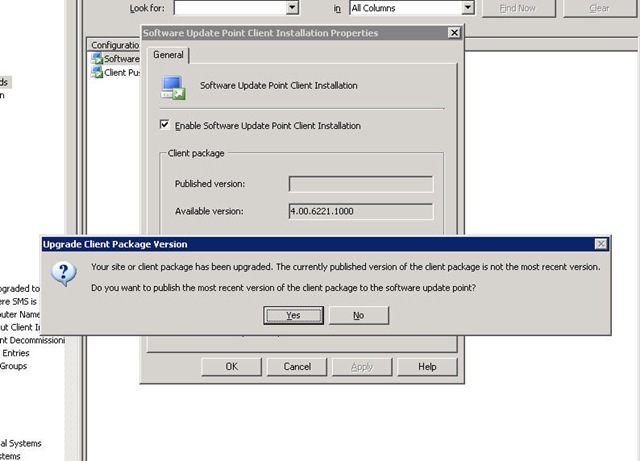 If the client software on the Configuration Manager 2007 site server is a later version than the client version stored on the software update point, the Upgrade Client Package Version dialog box will open. Click Yes to publish the most recent version of the client software to the software update point. Client installation will begin when the next scheduled scan starts on client machines. The default value is every day at 3:00AM, however, this may be different if you have configured the Configure Automatic Updates Group Policy setting covered in the Configure Windows Update Group Policy Object above. This section will help you force the Windows Update Agent scan and verify the install is successful. This is useful in a test installation or pilot deployment. If there are no preceding updates, the Configuration Manager install should start within several minutes. Look for the log entry called "Installation succeeded"
These installation properties are found by the client querying AD. If your machines aren’t able to query AD, or you want set these ahead of time, you can provision them by using GPO ADM templates covered in the section Configure Client Assignment and Installation settings via Group Policy above. It is important to note this installation method requires that Site Boundaries are created and that the client being installed fall within the site boundary entries. When a client queries AD, it uses Site Boundaries to determine which site to connect to. In order to bypass this requirement, provision client installation properties ahead of time using Group Policy. You can verify the client was successfully installed by opening the Configuration Manager applet in Control Panel and checking the settings. You will see the Assigned Site and Management Point the client is using.